This is, of course, the time of year when the so-called grownup movies come out in wider release, intending to raise Oscar buzz and ticket sales. The moment that someone proves that Oscar buzz no longer has anything to do with film ticket sales, then forget it; cinema from now on will be superhero comics adaptations and maybe horror sequel/reboots. Nothing else. Filmic photoplays had a hundred years and ten to be relevant, then they were done. Oh well, could be worse. Soviet Communism failed earlier. Still, in honor of movies attempting to be about things that matter (and, in some opinions, in relation to Communism), let's acknowledge CESAR CHAVEZ, an okay, solemn bio covering the most prominent activist years of Hispanic union organizer Cesar Chavez (1927 - 1998). It comes from actor-turned-director Diego Luna, who apparently borrows the hand-held camera from TV's Law & Order. I don't want to denigrate his total-pro, deglamorized approach with the semi-pejorative adjective "workmanlike,' though in context I guess the cliché fits. If so, at least it's a union shop. 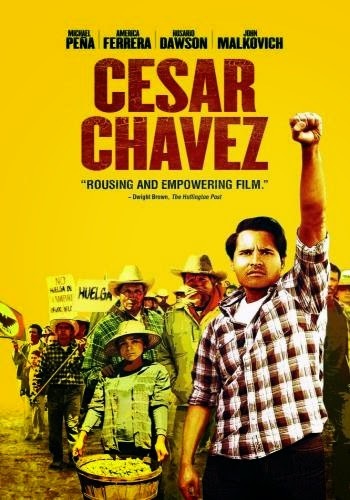 Chavez (Michael Pena) comes to prominence in Delano, California, in the 1960s, rallying ill-paid farm workers to fight for rights and proper pay, despite Cold War accusations of being a commie subversive while skillfully negotiating the racial divisions between Latino and Filipino migrant grape-pickers. Soon Chavez is being championed by Robert F. Kennedy (portrayed with a halo by Jack Holmes), while California governor Ronald Reagan (represented here in generally unflattering audio clips) clucks disapprovingly of lefties meddling in Big Business. Speaking of which, Mafiosi-like agri-tycoons truck in scab workers and illegals to break Chavez' strikes. The don of them here is played by John Malkovich, with the curious Hollywood-referencing name Bogdanovich. When his own allies react with thug tactics, the Gandhi-like Chavez chews them out, then feels compelled to undergo a well-publicized 28-day protest fast, drawing wide support for his boycott of California wines. RFK is very concerned, while Chavez becomes Time's Man of the Year. The latter is a detail that tends to get my cynicism up in a major way, especially in biopics (BORN ON THE FOURTH OF JULY, for one); our protag suffers, but in the end he gets the reward of being famous. Really famous. You know, like a Real Housewife or a MTV Teen Mom. That's how you know they're the good guys. How awfully Tinseltown. Chavez' human failings are trotted out, albeit in rather desultory fashion. He had no time to be much of a family man or father, and he has some childish jealousy over the activism of his equally committed wife Helen (America Ferrara). Malkovich, in the disc extras, talks about the elaborate immigrant backstory he secretly gave his Bogdanovich character to flesh out the role somewhat beyond which shows up onscreen. Method actors, go figure. If only all that energy and imagination could be harnessed for finding miracle cures, or something. But that must be against rules of the Screen Actors Guild. What might most impress viewers today is the glorification of the labor-union movement, not exactly a theme one sees anymore when just about every article at your surviving Local was probably bought at Wal-Mart, and made in China by slaves. And the righteous hero doubtless needs an intro for young, movie-going millennials, who probably think Cesar Chavez is just the Hispanic dub of that simian hero in the PLANET OF THE APES series.